B noted several places where the meaning of some rule or example was unclear. These were generally easy to address. The excellent questions were the ones where we weren't 100% sure what was being asked or why B used a certain keyword in their question—those revealed gaps and leaps of logic in the philosophy and rules. Those are what bumped our editing from just a few hours to a multi-session affair with much discussion. The changes we made based on these questions don't add more than a few hundred words to the little book, but they reinforce the system's themes of consent, collaboration, and improvisation while being concrete and applicable. Since we were writing a book with Rosette LARP's themes, it was very easy to be... soft in our writing: "You may wish to," "Players might...," "It's possible to..." But when you drop a roleplaying book into actual play, folks need boundaries. After double-checking the intent of the rule, we switched several of those hedging phrases to statements of what the players must do and made clear what was truly optional. What Person Are We Speaking In? The handbook was written over several months, with revisions as we playtested and splashed with the occasional bout of overly flowery writing. It started with a conversational tone in the second person, but lapsed into an awkward and wordy third-person at times. Several of our gameplay examples got convoluted by being in the wrong point of view. Once we starting seeing B's edits to tighten up those wordy parts, we realized we needed to pick a convention and stick to it. That's turned out to be second person except for where an example is clearer and succinct in the third person. It reads much better now. Next, we ask B for another light round of edits while we prepare things like cover art, storefronts, and press lists. Once we have a final draft, we begin typesetting in ConTeXt for final publication. 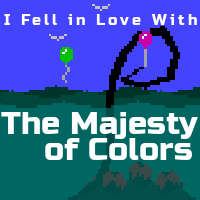 We've written before about our current situation of running multiple projects, so we're doing these final touches alongside the final touches of "(I Fell in Love With) The Majesty of Colors." Not long until we can announce official release dates for both!